My vote-by-mail materials arrived the other day for November's election. I know these mid-terms are a huge big deal here in America, but I have beef with voting more than once in any given year. It seems like a frivolous waste of time and money to me, not to mention it kills both civilian enthusiasm and voter turn out. Sigh. Yes, this will be like the third or fourth time in 2018 I've cast a ballot. Is it any wonder I leave it to the last minute? I'm usually up until three o'clock in the morning the night before desperately researching who to vote for, and then I have to actually show up at the polling place to drop off my absentee ballot in person--knowing full well my vote probably won't get counted. Still, it's one of the most important civic duties I've been given as a citizen, so to the best of my ability, I persist. Last election, on June 5th, I sat at The Cheesecake Factory during happy hour pouring over my vote-by-mail materials. There were so many crazy people running for all sorts of things, I could barely get past the candidate statements. And who on earth am I supposed to want on the school board when I don't even have kids... The more whiskey sours I consumed, the funnier the whole thing became. Especially the guy running for mayor who went off for three paragraphs about how we're being poisoned by the drinking water. Like, this is LA. Who here doesn't drink bottled? I really need to not leave this election until the last minute. I need to stop procrastinating and start researching. I need to do my part to help my country out of the partisan divide we're deeply enmeshed in. Because somewhere along the way, we citizens of the United States of America have forgotten how to act like adults. How to compromise. How to work together for the common good. Hell, we can't even agree on what the common good is anymore. Nor can we agree on what constitutes a citizen. It's sad, living in an America I most certainly did not grow up in. I honestly don't know if there's a way out for us, or if we'll eventually erupt into another civil war. But the one thing I can do to speak my voice, promote my values, and hopefully influence positive change, is to vote. Disabled at the age of twenty-eight by the mysterious illnesses chronic fatigue syndrome and fibromyalgia, five years later I survived two life-threatening strokes. Clinging to life and determined to change my trajectory, I embarked upon a journey to reclaim my lost health. Never easy but always worth it, I write to share the reality of both embracing and overcoming a life most unexpected. Thank you for joining my thorn-riddled stumble through the complexities of living with chronic illness. The author of this blog is a patient. All information contained in this blog pertains to my personal experience and is for informational purposes only. It is not a recommendation or suggestion for any other patient. Please consult a doctor for diagnosis and before beginning or stopping any treatment or medication. 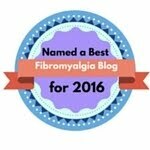 All material, written and conceptual, contained within this "Chronicles of Fibromyalgia" blog are under copyright and the sole intellectual property of the author. Any use or reproduction of these materials is strictly prohibited without the expressed written consent of the author. 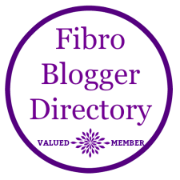 "Chronicles of Fibromyalgia" "The Ups, Downs, and Sideways Progress of a Woman Conquering Life with Chronic Illness" "The Fibromyalgia FunHouse" "Purple Pain Code: Lilac-Light, Mulberry-Medium, Amethyst- Awful" All Materials Copyright 2010-2018 Leah Tyler. Photos are licensed to share and use. Chronicles of Fibromyalgia ©. Watermark theme. Powered by Blogger.